Transaction Costs and Organizational Structures - Why Does the Firm Arise? 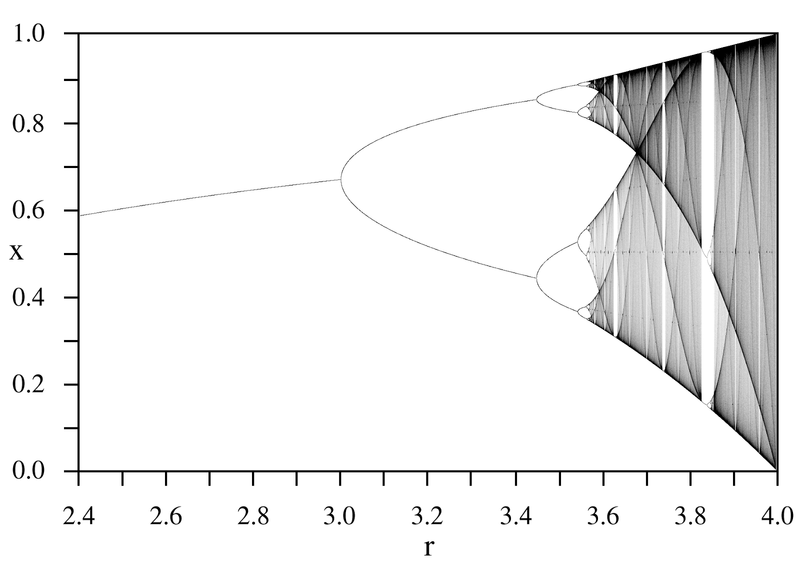 In the last post I briefly introduced some aspects change related to intensive properties and the concepts of formal cause and attractors. I want to now extend this line of thinking in order to explore the future of work. 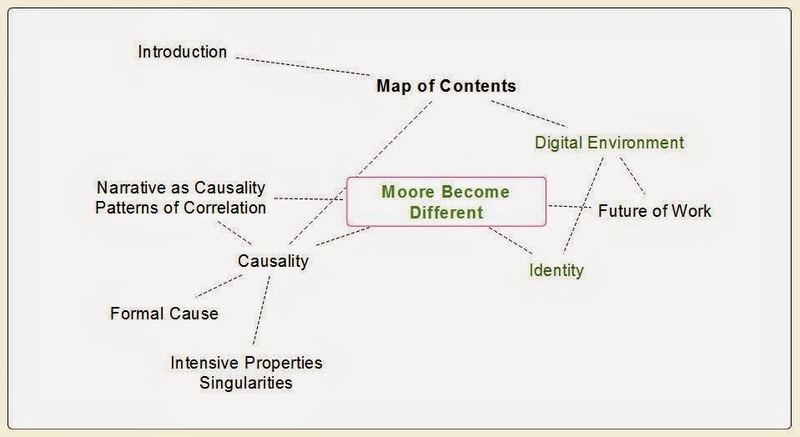 In the first post of this series “When Moore Become Different”, was setting the frame that sometimes changes in quantity can produce dramatic qualitative change. In this post I’m going to make a case that the exponential rates of technological innovation that are shaping the emerging digital environment are enabling a ‘more is different’ phase transition from an organizational attractor of the last 5,000 years to a new organizational attractor. 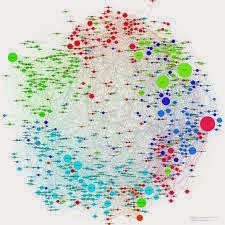 The traditional attractor is one that has favored centralized, hierarchical ways of organizing large scale human effort – the attractor of the digital environment appears to enable the scaling of distributed, networked forms of organizing. "Now the present is the length of a news cycle some days… The present is really of no width whatever." “I have to figure out what it means to try to write about the future at a time when we are all living in the shadow of at least half a dozen wildly science fiction scenarios." Gibson’s observations highlight just how fast things are changing and how difficult it is to extrapolate today into a vision of tomorrow. Jeremy Rifkin notes that societies undergo fundamental transformation when technology revolutionizes how energy is harnessed, communications is enabled and transportation is coordinated. He outlines an emerging technology platform/infrastructure that includes: the Internet-of-Things (IoT) being built through the rapidly developing Communication Internet; a nascent Energy Internet; a Logistics Internet and new paradigms of manufacturing. The IoT will connect everything and everyone. The IoT includes uncountable sensor attached to resource, production, energy, logistics networks and flows – which in turn are producing unimaginably large data trails for analysis. Included in this emerging fabric of the digital environment are the unprecedented possibilities of distributed crypto-applications like the Bitcoin blockchain. The IoT of sensors, may make it impossible to ever again contain our personal information within the boundaries of previous concepts of privacy. I will start first with an exploration of transaction costs as inevitable constraints that are necessary to do work. All complex and living system require some form of constraints. Kauffman provided me with a profound flash of insight in relation this that constraints are what enable both the release and the harnessing of energy and information necessary to perform work. The first surprise is that it takes constraints on the release of energy to perform work, but it takes work to create constraints. The second surprise is that constraints are information and information is constraint. Stuart Kauffman – quoted in Deacon (2012). While there are a number of important constraints that I want to talk about – in this post I will focus on the basic nature of transaction costs as fundamental in shaping certain social-structural constraints. Ronald Coase won a Noble in economics for asking “Why Does the Firm Arise” in a market economy why are people gathered under one ‘umbrella’ to get things done”. These costs involve the material, effort, attention, energy, time and information flows embedded in the production systems (including search, negotiating terms, coordination, enforcement and communication). The distributed and decentralized ‘anarchy’ of market systems began to be more efficient only when the population increased in size and density and communication/transportation systems dramatically reduced transaction costs and increased complexity through enabling ever more specializations and divisions of labor. So despite the ‘efficiency’ of potential market systems, it was by sharing purpose; dividing labor; and providing control through establishing roles, responsibilities and methods of communication – it remained both less expensive and easier to get things done. The hierarchic organizational structure was efficient despite the emergence of ‘efficient’ market systems. For example, it is costly for everyone (in time, effort, money and resources) to search for employees or work opportunities, to constantly negotiate enforceable terms and compensation, and to coordinate collective effort toward common purposes (principal-agent problem). Longer-term contracts, divisions of labor, and other structures of the organization enabled significant savings in costs as well as higher productivity. But efficiency is not the only constraint, according to Douglas Allen, there is another important dimension of the constraint inherent in transaction costs. In Allen’s reading of Coase, transaction costs are the costs (time, effort, money, opportunity) necessary to establish and maintain any system of rules and rights. These rules and rights in turn define what institutions are – systems of rules which also mean that individuals and organization are merely the players/agents in the systems of rules (although they all inevitably try to shape the rules in their favor). The implication of this is that transaction costs also include the costs of mitigating bad behaviors. According to Allen, institutions emerge to maximize wealth and minimize the costs of establishing and maintaining themselves. Some people prefer goods produced by firms. These more human constraints are and will continue to feel the disruptive impact of technologies shaping significant socio-cultural expectations – I will explored this more deeply in later posts focusing on issues related to the shaping of identity. The effective upper limit on the size that a traditional organization can reach and continue to be efficient, is the threshold where the internalization of transaction costs begins to exceed the transaction costs of a market situation. As the organization gets bigger there will be diminishing returns to efforts to create more efficient management regimes. This is a very important threshold – as the digital environment continues to collapse the traditional parameters of transaction costs this threshold gets increasingly lower. The evolving digital environment is enabling a profound collapse of traditional transaction costs – including the near zero marginal cost economy that Rifkin describes – a phase transition representing a changes in the conditions of change. We can see this already with the emergence of new platforms of productivity, new ways to get things done and new types and varieties of exchange. The costs of new patters and rates of interactive exchange, as well as those associated with search, negotiation, enforcement, coordination and communication continue to collapse. This means new and different types of intensity thresholds (density, connectedness, etc.) are instigating a massive societal phase transition. Throughout the history of human civilization (after humans had become agriculturalist and before the advent of the digital environment), there have been environmental constraints shaping transaction costs. These transaction costs determined the attractor of efficient organizational structures, which have until the digital environment been hierarchic. We know that for most of human history we have lived in small group of hunter-gatherer what have always been relatively egalitarian (not as we would define equality, but focused on constraining hierarchic social structures). The tendency to hierarchic structure has been much less a result of human traits and much more the result of the attractor of organizational efficiency. We are in the midst of transitioning a fundamental threshold enabling new types and varieties of exchange through an exponential decrease in transaction costs – including those related to patterns and rates of interactive exchange, as well as those associated with search, negotiation, enforcement, coordination and communication. In this way, different types of intensity thresholds (density, connectedness, etc.) are instigating a massive societal phase transition. The digital environment entails the emergence of new constraints. As these new constraints become more established and widespread (e.g. approaching near zero marginal costs) they will determine a different attractor of organizational efficiency. 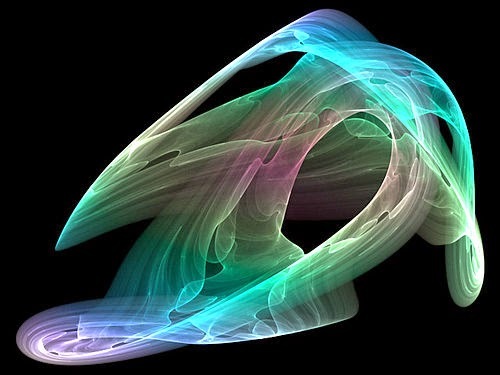 I think of this new attractor as social computing. Jeremy Rifkin in his book “Zero Marginal Cost Society” refers to the emerging ‘collaborative commons’. example of the ‘pin factory’ we have known that economic prosperity and productivity gains are founded on the division of work into ever smaller units. Correspondingly the increase in population density of urban life has enabled the sustainment of ever more specialized work and workers. In essence, this theory proposes that the digital environment establishes the conditions that not only are increasingly enabling but will inevitably induce hyper-connectivity which in turn enable/induce a hyper-differentiation-of-labor/specialization. The paradox of increasing specialization and hyper-differentiation is a corresponding dependence on exchange – and in the digital environment this means hyper-exchange. The result is an acceleration of knowledge flow – a hyper-knowledge metabolism. Thus, the phase transition inaugurated by the digital environment will require new design principles for harnessing human capital, new institutions, new social structures and a new political-economic philosophy. The issue of new institutions is profound. Douglas Allen argued that fundamental institutional revolutions emerges that was driven and enabled by new technology that allowed people to mitigate the randomness of nature. For example the steam engine allowed energy to be produced more reliably and ships to be able to navigate with much less dependence on natural forces (e.g. wind and tide). Inexpensive time pieces enabled coordination of activities across all social domains and time zones. New capacities to measure behavior created new means to manage systems. Jeremy Rifkin outlines many key transformations emerging today. For example, Solar & Wind are following a Moore’s Law type trajectory suggesting that it is not if, but rather when, we get cheap abundant energy. The Internet of Things (IoT) is enabling the emergence of whole new paradigms of logistics, communication, organization and coordination. The emerging of 3D printing will (sooner or later) change the way we make and distribute goods. Advances in AI & robotics (how smart and/or capable will Baxter the robot, be in 2025 – especially when Baxter is connect to Watson?) suggests that whatever can be automated will be and whatever involves information will be disrupted. The emergence of Augmented reality will transform pretty much all professions. How soon will it be, when you won’t trust your doctor, because she isn’t wearing a device that connects her to Watson (who’s read all the medical literature up-to-the-minute and can diagnose/compare state of the art treatments), to augment her knowledge with AI analysis. These advances, in technology can’t just be overlaid onto existing social and organizational structure and be expected to provide optimal benefits including increased productivity. For example, I think of the tremendous value that Wikipedia has and continues to create, yet remains outside of any current measure of any nation’s GDP? How could this value be distributed properly to the creators of this value (both those add and curate the content and those who use it to add value elsewhere)? The ‘message’ (change in scale, scope, pattern, pace of behavior enabled by a medium) of the digital environment as social computing means that social computing is displacing the architecture of industrial machine and its hierarchical management structures. Examples of social computing increase daily but include Wikipedia, Uber, Open-Source, FoldIT/eteRNA, etc. Essentially social computing is the capacity to assemble knowledge networks (my assumption is that knowledge lives only in people and their living networks) as and when needed. The future now is less about the assigning work to the ‘person in the job’ and much more about connecting the ‘person best able’ to add value to the work-at-hand. But how do we enable the new organizational, and participatory architectures with the requisite social and governance institutions? It is no simply about liberating working in an unchanged society. What does a society and the world economy at large need to harness full human wealth – to bridge the ingenuity gap? We fundamentally need to re-think how to distribute the gains of productivity. Especially since more and more of traditional productivity will be delivered via AI and automation. We need a 21st Century social platform. In the next post, I will begin to explore the nature of social and system constraints on identity, for the development of institutional innovations that will demand us all to rethink the necessary constraints for the creation of value in the digital environment. Coase, Ronald. 1990. “The Firm, the Market, and the Law”. University Of Chicago Press. Allen, Douglas. 2011. “The Institutional Revolution: Measurement and the Economic Emergence of the Modern World”. University Of Chicago Press. Rifkin, Jeremy. 2014. “Zero Marginal Cost Society: The Internet of Things, the Collaborative Commons, and the Eclipse of Capitalism” Palgrave Macmillan Trade.